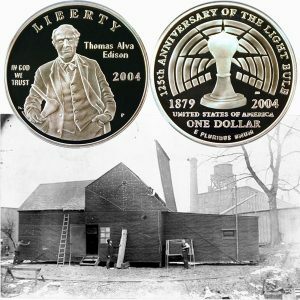 Today, the Edison Commemorative Silver Dollar Coin remembers when they completed the studio affectionately named “Black Maria” on February 1, 1893. In December of 1892, the photographic work in connection with this young kinetoscope demanded a building for itself — the first motion picture studio in the world. So work was started on a curious structure, the like of which had never been seen before. It was a little house of light timbers and black light-proof tar paper, built on a turn table. The speed of photographic materials and camera lenses was much lower then than now and the snapshots for the kinetoscope had to be made in full light. There were thirty to forty pictures a second then. Therefore, the building was pivoted so that the tiny stage could always be turned to catch the sun, regardless of the hour of day. The “Black Maria,” then known officially as the “revolving photographic building,” on the Edison account books, was completed February 1, 1893, at a total cost of $637.67. The making of motion pictures for ultimate public presentation was begun in that building. All picture making before that had been but the simplest of laboratory work for the testing of the machines. Early in 1893, the kinetoscope was shown to a scientific gathering at the Brooklyn Institute, and not long thereafter it was presented to the public for the first time as an exhibit at the Columbian Exposition, greatest of the world’s fairs, held at Chicago. With this exhibition, trivial as it seemed then, the greater events of the history of the motion picture had their beginning. It was an unpretentious oblong wooden structure erected in the laboratory yard, and had a movable roof in the central part. This roof could be raised or lowered at will. The building was covered with black roofing paper, and was also painted black inside. There was no scenery to render gay this lugubrious environment, but the black interior served as the common background for the performers, throwing all their actions into high relief. The whole structure was set on a pivot so that it could be swung around with the sun; and the movable roof was opened so that the accentuating sunlight could stream in upon the actor whose gesticulations were being caught by the camera. These beginnings and crudities are very remote from the elaborate and expensive paraphernalia and machinery with which the art is furnished to-day. When we consider the subject of motion pictures we find a similarity in general business methods, for while the projecting machines and copies of picture films are made in quantity at the Orange works (just as phonographs and duplicate records are so made), the original picture, or film, like the master record, is made elsewhere. There is this difference, however: that, from the particular nature of the work, practically all master records are made at one convenient place, while the essential interest in some motion pictures lies in the fact that they are taken in various parts of the world, often under exceptional circumstances. The “silent drama,” however, calls also for many representations which employ conventional acting, staging, and the varied appliances of stage craft. Hence, Edison saw early the necessity of providing a place especially devised and arranged for the production of dramatic performances in pantomime. It is a far cry from the crude structure of early days — the “Black Maria” of 1893, swung around on its pivot in the Orange laboratory yard — to the well-appointed Edison theatres, or pantomime studios, in New York City. The largest of these is located in the suburban Borough of the Bronx, and consists of a three-story-and-basement building of reinforced concrete, in which are the offices, dressing-rooms, wardrobe and property-rooms, library and developing department. Contiguous to this building, and connected with it, is the theatre proper, a large and lofty structure whose sides and roof are of glass, and whose floor space is sufficiently ample for six different sets of scenery at one time, with plenty of room left for a profusion of accessories, such as tables, chairs, pianos, bunch-lights, search-lights, cameras, and a host of varied paraphernalia pertaining to stage effects. The second Edison theatre, or studio, is located not far from the shopping district in New York City. In all essential features, except size and capacity, it is a duplicate of the one in the Bronx, of which it is a supplement. To a visitor coming on the floor of such a theatre for the first time there is a sense of confusion in be holding the heterogeneous “sets” of scenery and the motley assemblage of characters represented in the various plays in the process of “taking,” or rehearsal. While each set constitutes virtually a separate stage, they are all on the same floor, without wings or proscenium-arches, and separated only by a few feet. Thus, for instance, a Japanese house interior may be seen cheek by jowl with an ordinary prison cell, flanked by a mining-camp, which in turn stands next to a drawing-room set, and in each a set of appropriate characters in pantomimic motion. The action is incessant, for in any dramatic representation intended for the motion-picture film every second counts. The production of several completed plays per week necessitates the employment of a considerable staff of people of miscellaneous trades and abilities. At each of these two studios there is employed a number of stage-directors, scene-painters, carpenters, property-men, photographers, costumers, electricians, clerks, and general assistants, besides a capable stock company of actors and actresses, whose generous numbers are frequently augmented by the addition of a special star, or by a number of extra performers, such as Rough Riders or other specialists. It may be, occasionally, that the exigencies of the occasion require the work of a performing horse, dog, or other animal. No matter what the object required may be, whether animate or inanimate, if it is necessary for the play it is found and pressed into service. These two studios, while separated from the main plant, are under the same general management, and their original negative films are forwarded as made to the Orange works, where the large copying department is located in one of the concrete buildings. Here, after the film has been passed upon by a committee, a considerable number of positive copies are made by ingenious processes, and after each one is separately tested, or “run off,” in one or other of the three motion-picture theatres in the building, they are shipped out to film exchanges in every part of the country. How extensive this business has become may be appreciated when it is stated that at the Orange plant there are produced at this time over eight million feet of motion-picture film per year. And Edison’s company is only one of many producers. The Edison Commemorative Silver Dollar Coin shows with an image of the studio, “Black Maria,” circa 1890s.